This devastating opera, originally banned by Stalin during the Soviet era, is presented in a rare live performance in UK cinemas from Paris Opera. 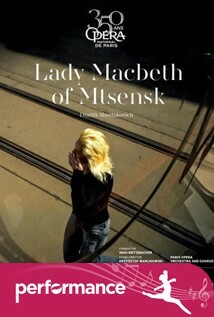 Of Shostakovich’s initial undertaking – a trilogy on the tragic destinies of Russian women through the ages – only one opera was ever written: the hard-hitting ‘Lady Macbeth of Mtsensk’. Although one of the mainsprings of the work, the Shakespearean parallel is here bitterly ironic: unlike Lady Macbeth, Katerina Ismaïlova who, in the remote reaches of rural 19th century Russia, falls in love with one of her husband’s employees and is finally forced to commit suicide, is less a manipulator than a victim of a violent and patriarchal society. Krzysztof Warlikowski liberates all the subversive power of this scorching and scandalous work, which marked the early years of the Opéra Bastille. UK viewers may recognise the basic plot used also in the outstanding recent UK film ‘Lady Macbeth’ from the same Russian source. An Opera in 4 Acts and 9 scenes by Dimitri Shostakovich, sung in Russian with English subtitles. 160m approx inc one interval. The stage production is performed at the Paris Opera with a note of warning: Certain scenes may be inappropriate for the young and the easily offended. PLEASE NOTE THAT THE INTRO FROM MOSCOW STARTS AT 18:15 FOR A PROMPT PERFORMANCE START AT 18:30.